China in Africa: The Real Story: Michael Gerson on "China's Aid Invasion"
The Obamas with the Equatorial Guinean dictator. This morning's Washington Post had a critical op-ed on China's aid (or is it investment? the online version has "investment" in the title, the print version says "aid") to Africa by conservative columnist Michael Gerson. While less hyperbolic than columns on China's "aid" by Freedom House and others over the past few years, Gerson nevertheless falls into some of the same pits: the double standard; and the mixing up of aid and business. Gerson writes "in Africa today, America consistently promotes economic liberalization and good governance..." Just how consistently we do this is open to debate. For example, the US provided -- each year -- about $1.6 billion in aid (economic and military) to repressive Egypt under Mubarak. "[t]he US finds it hard to criticise a country which is seen as an ally in a volatile, oil-rich region. In 2006, Secretary of State Condoleezza Rice hailed President Obiang as a "good friend" despite repeated criticism of his human rights and civil liberties record by her own department. 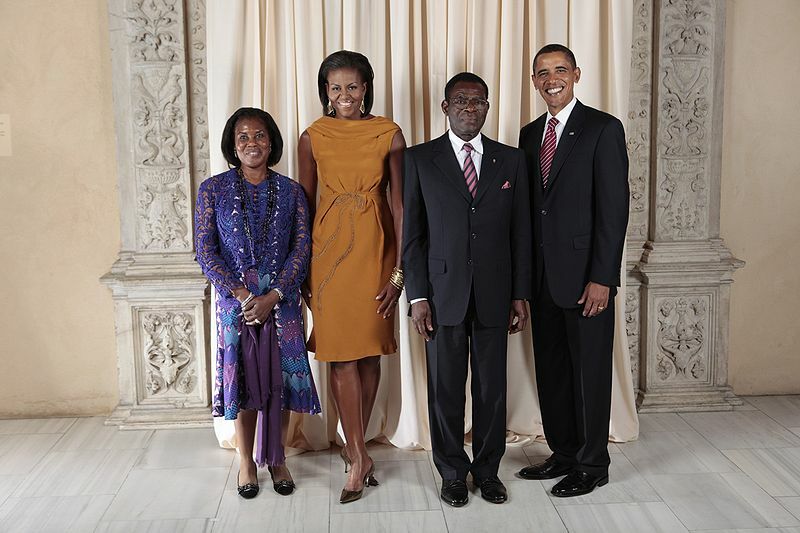 More recently President Barack Obama posed for an official photograph with President Obiang at a New York reception." There is plenty to criticize in China's human rights record at home, and plenty of room for improvement as Chinese leaders take uncertain and inconsistent steps toward being a "responsible great power". But let's get our own record straight, Mr. Gerson. Your op-eds will be more credible to Africans if you do so. I think you will find this interesting - BBC survey shows that China is most popular amongst African nations. Excellent retort! Mr. Michael "Axis of Evil" Gerson is such a disgrace that his space in the WAPO editorial column says much more about the newspaper than another mindless utterance by an infantile propagandist like Gerson (in this case he continues the worn out and easily deconstructed meme: China = Bad, America = Good). When a friend sent me the WAPO editorial fI let him know Gerson's mind is rubbish and then provided him the link to your column for some much more sensible and well reasoned and researched insight. Keep up the good work and if the WAPO ever decides to retire the editorial columns of discredited individuals like Gerson and instead open a space for people like you I may actually consider reading the WAPO website. As so often, I fully agree with what Professor Brautigan says, but at the same time I completely agree with everything Michael Gerson says in his article on the Chinese investment in Africa itself, especially if he brings in the question "Who benefits? ". He himself uses the term "neo-imperialism", and let me assume for convenience, that this could strike both the U.S. and China . Where, however, I walkaway is as he claims some kind of moral high ground for the actual attitude of the U.S. and the West in relation to Africa (good governance, HR, transparency, rule of law…). Certainly, the U.S. has left behind its wild west phase of neo-imperialism and uses nowadays a more moderate and cooperative (with the local elites) form of it. who took over the demands of local people in Africa and, often successfully , tried to impose this on the U.S. government and the multinationals by US law or regulations. The IMF has recently published an interesting report on 12 January 2011. "The New Growth Drivers for Low Income Countries: the role of the BRICS". This study affirms many of your arguments about the role of China in Africa and in other developing countries -- while debunking many of the extreme criticisms about China coming from the Western Media. It has a lot of interesting data on FDI and the role of China's diaspora that add more details to your excellent book and articles. Yes, Professor Brautigam, you are right about US diplomacy towards Africa. You are also right when, in your book, your articles, papers and entries in this blog, you criticize the West for its approach to developing nations. For centuries, Westerns have believed that our values where unique and global, as Edward Said’s “Orientalism” pointed out. However, I must disagree with the assumptions in your entry. I am living in China since 2007 and no offense, I think you have a huge knowledge about Africa, but not very much about China itself (Did you ever lived here? Taiwan is another story...). China might be trying to do the same than the West in Africa, as well as in Latin America or in other developing regions. This is to get access to the resources it needs (and markets for its products). But there are several points very different that, now, you seem to openly ignore: rule of law, freedom of speech and, to sum up, the great system of checks and balances in which our imperfect democracy is based. And that is why you can write about all these topics in your blog, criticize openly your country and your leaders, disagree with the mainstream, go on field and check if the Western media is “balanced” or not... Me, however, as 1.3 billion people, we have to use a VPN to read your blog from China, while Beijing is, just right now, carrying a huge crackdown on activists and lawyers (200 people formally detained, accused or ‘abducted’). Since you are not in China, you can read on the Western media (there is not a single word on the Chinese one, don’t waste your time). I just wonder if you take all this in account when you write about China and Africa. Formulate “positives critics” is good, but careful not to fall in love with the newcomer you don't seem to know in detail. "Many of the extreme Criticisms about China coming from the Western Media"
I try to follow what happens in the world on a daily basis and so for a dozen countries. And whether this is an imbalance I don’t know: enter for instance, the neutral term "china" to any news aggregator and you'll receive a laundry lists of articles and certainly more than half of them will refer to stock market and investment news that presents China as a walhala for international investors. No wonder Wall Street is sometimes referred to as the fan club of China. But on the other hand, there is a systematical disregard for the exponentially growing dissatisfaction with China in Africa itself. Even though I see it for years, it remains anecdotal, and such examples will not convince. Or mayby one from yesterday, from the mouth/hand of someone who certainly is not against the Chinese presence in Africa. Here it is in Namibia, but I would not know which African country would constitute an exception on this rule. And the reasoning here is very often partly rational (eg we see Chinese do the work that we used to do), partly irrational (such as when in restaurant Plaza, in Kipuchi Katanga, the Chinese TV is, via its decoder, blocked on CCTV (with French subtitles), and all the audience wants a national channel because a shooting is in progress at the Presidential Palace, then everyone assumes that this is a conspiracy orchestrated by Beijing to suppress the Congolese people…) . Thanks for the comments. They help make clear the challenges raised by the rising strength of the relationship between the PRC and the many African countries that are now hosts for Chinese investment, aid, immigration, trade. And yes, I know from personal experience that my blog is blocked in China! Dan's comment above on the risks of pogroms is all too real. As I've noted before, "Tiger Mother" Amy Chua's earlier book "World on Fire" shows how similarly risky the position of economically successful immigrants is around the world when democracy combines with economic instability. Which is not to argue (as the Chinese government does) that democracy should therefore be suppressed, but rather that these risks are real and need to be addressed proactively. Well! In many countries and especially in big towns like metropolises, capitals etc. there are foreigners who manage their shops to earn their living and make profits. It must be acknowledged that the relationship between the Chinese nationals who settle in a country and the locals often are very difficult, because of the language barriers, the cultural gap and ignorance of the local customs. Too often, the Chinese migrants thoroughly ignore what the locals deem important, like trying to speak their language correctly without making a mess of it(pidginization! )that is perceived as a sign of contempt, very poor inter-community friendly exchanges, that is perceived as a manifestation of superiority complex, etc. So, the Chinese nationals trying to settle abroad should absolutely endeavour to seriously correct these faulty behaviours. Michael Gerson, Hillary Clinton, David Cameron etc. : same stuff!